Negroskull Mountain, 1963 - 2006: R.I.P. It was during this month in the year 1777, that the Overhills Cherokees in Tennessee negotiated the Treaty of Long Island of the Holston, whereby they relinquished their claims to the land occupied by whites in east Tennessee. Located just east of the junction of the North and South Forks of the Holston River, Long Island was a sacred council and treaty ground surrounded by the vast hunting territory of the Cherokee Nation. Starting at Long Island in March 1775, Daniel Boone (1734-1820) led a team of 30 axmen to open the trail through Cumberland Gap that was to gain fame as the Wilderness Road. Between 1775 and 1795, this trail was used by more than 200,000 emigrants. Condition:The island has been covered with chemical factories and lost its integrity. The island is about four miles long and one-half mile wide. Colo. Christian spoke as follows. Our business at this place was to make peace with our ancient allies the Cherokees; . . . to fix a boundary between you and your brothers of Virginia that may stand firm & unbroken thr'o ages yet to come. . . . You are sensible that if we had a desire or wanted your land, we should have left an army in your Country and not have invited you to treat with us. . . . we propose to give you two hundred head of breeding Cows and one hundred head of Sheep for it, by the fall to be delivered at this place when the line is run, at which we desire some of your Warriors to be present that your people may have stocks of their own. This stock we give as a compensation for the land that falls within our state when the boundary line between Virginia and North Carolina is run, which may be of great use in cloathing and supporting your people. The Commissioners then withdrew, and left the Indians alone to consult, after a short time being met again, the Raven spoke as follows. Now my elder Brothers shall hear what I have to say which is the certain truth without wavering. You and me have each other fast by the hand and we will forever keep our hold; altho some differences may arise in our opinion, while we are talking the friendly talks together. The bright chain of friendship is laid aside till we can settle the bounds of our Countries. . . . My elder Brothers desired me to mention a boundary, and after that you proposed another. 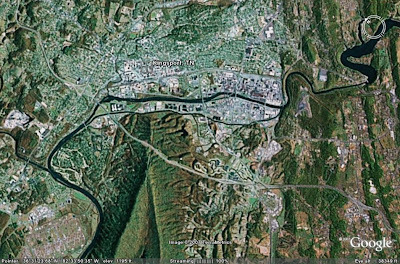 But I tell you now we will begin our line at the mouth of big Creek just below Robinsons fort, and run thence a straight line three miles to the left of Cumberland Gap. Colo. Christian then spoke as follows. th'o from the mouth of the Creek you mentioned, to that we proposed, the line to begin at, is but a verry little way, it will leave out near twenty of our people, who have planted corn there, and can be of little use to you. Therefore we expect you will allow the line to begin at the mouth of the second Creek below the ford and extend to the place you point ouy in Cumberland mountain. The Raven then spoke as follows. I depend on you to let the Governor of Virginia know that I had fixed a boundary, but that at your request I suffered it to go up to the place you propose upon my land. Col. Christian spoke as follows. We have now settled the boundary between you & your Brothers of Virginia and you may be assured our Governor and great council will make it verry strong. What we have promised you shall be delivered when we run the line, of which you shall have due noticed. We will inform our Governor, of your friendly behaviour at the treaty, and show him your good talks. Somehow, you can see how real estate developers and their cronies would have felt right at home in this scene. Some things don’t change all that much. The Long Island of the Holston River…is a cursed place with a checkered history. This was once sacred ground to the Cherokee Indians--a place of peace where no man could be killed. It was also a meeting ground where treaties were written and agreed upon. On July 20, 1777, Cherokee chiefs--including the legendary Attakullakulla--and white soldiers signed a treaty there that forced the Indians to give up millions of acres of their territory, including the island itself. The decision was not unanimous--especially among the rank and file. It is said that, after the signing and as the Indians were leaving, a medicine man cured the island saying that no white man would ever live there in peace. Undeniably, this curse still holds true today. Over the year, Long Island has been the scene of a number of violent murders, including that horrifying day in 1925 when a fugitive named Kinnie Wagner gunned down a number of law enforcement officers who had come to arrest him. Long Island is even considered haunted. Tales are told of an apparition who roams is island, armed with a long knife, who attacks couples who go there at night to be alone. There are no houses on the island and about half of it now contains a park administered by the City of Kingsport. The other half of the island--ironically--is the home of a waste treatment plant owned by Tennessee Eastman. Indeed, even if they could, no one would want to live there. Finally, link over to Discover Kingsport for "new images historically imagined" of Long Island. I really like these. The photographer has taken present day photos of Long Island, and then altered the photos to take out the "improvements" to the land. Not exactly before-and-after photos…more like after-and-before. Great concept behind this site. The photographer wanted to see "old Kings Port" as he imagined it might have been. My family and i grew up in long island.It once was a very pretty place and yes it did have houses there before the eastman bought it out.Only a few of my family members are alive most have past way from cancer or have found out they have cancer.My father always said people from the "island"in someway have had a curse on them either sickness or have murdered someone but for me it was a place that was great AND BEUTIFUL when i was a littleone. I need to take a ride up that way. I'm always curious about places with a rich history and I would be thinking about the time that a treaty was signed there. I lived on Long Island as a child, and wandered across the fields and woods at the headwaters of the Holston and Sluice. This area of the Island was a dairy farm, and the barn was a great place to get red worms for fishing. Near the tip of the Island was a shallow shoal that you could wade across the Sluice to the high cliff known as Big Rock. You could ascend to the top of the cliff over some well worn paths, not to say it was easy, or that you might arrive with less skin than you started with. I have spent plenty of time on a flat rocky point that jutted out over the river; with the minds eye watching the Indians stalking a buck or another clan. What a wonderful place to spend a early autumn day with your dog. There is no doubt Long Island was heavily traveled by the native tribes, the evidence was every where. My grandmother had a truck patch in the back yard, and every spring I was tasked to spade the ground to prepare for planting. Every time I would turn over five or six arrowheads, once I found a long white point or blade about eight inches long. I moved away in 1966, but go back on occasion. It is sad to see what I consider desecration of a unique historic and sacred place. Long Island residents and friends held a reunion at Warriors Path Park on September 11th 2016, between 250 and 300 people showed up. There were a lot of hugs, tears, and laughter that day.